Most Christians know at least one person they hope and pray will have an encounter with Jesus. For Lucy Vidaur, a 25-year-old woman from Girona, Spain, that person is her friend, Eloisa. "My motivation to come here was so that she would come," Lucy said Friday at the Festival de la Esperanza (Festival of Hope) in Barcelona. Franklin Graham began his message by telling the crowd it was his first visit to Spain, and he loved the people, the scenery and the food. "I think maybe I've eaten too much," he laughed, saying his wife Jane may make him go on a diet once he's back home. She was thrilled when Eloisa agreed to make the hour-and-a-half bus ride to the Festival, held inside the former Olympic arena Palau Sant Jordi. Lucy had prayed for God to move powerfully during the Festival's opening night, but "I didn't imagine this." 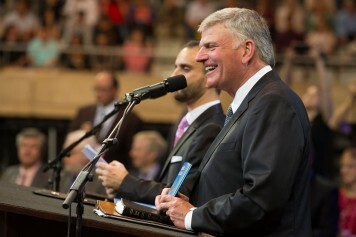 The first of the Graham family to preach in-person in Spain, Franklin Graham shared his own story of salvation with a packed-to-capacity crowd of more than 14,000. "I was 22 years old," Franklin said. "I wanted to go to parties. I wanted to have fun. I didn't want God in my life." But, he said, the party life left him empty, always wanting more. One day he decided he'd had enough. He got on his knees and accepted Christ, finally claiming his father's famous faith as his own. "That night, God forgave Franklin Graham," he told the crowd as an interpreter shared the message in Spanish. "I'm a sinner. I've been forgiven. And God will never judge me for my sins because Jesus paid my debt for me, and He paid yours." Lucy Vidaur (left) and a trained Festival counselor (right) pray with Lucy's friend Eloise after she asked Christ into her life. As Franklin-along with local believers and music artists including Marcos Vidal, The Afters, Psalm 150 and a spirited choir of more than 400 Catalonians-shared the Gospel, Lucy could tell something was stirring in her friend's heart. When Franklin gave an invitation to accept Christ, the two young women walked down the bleachers together, along with hundreds of others. Moments later, Eloisa made a first-time decision for Christ. Her boyfriend also went forward. 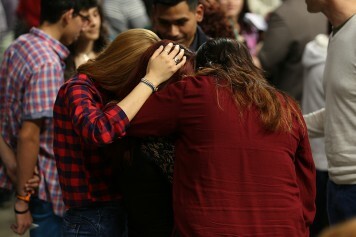 "I felt the words Franklin Graham spoke arrived at my heart," Eloisa said after a long time of prayer, hugs and tears with Lucy and a trained Festival counselor. Just a few feet from Lucy and Eloisa, another pair of friends experienced the joy of salvation. Nineteen-year-old John Sarria had invited his buddy Carlos to the Festival. Carlos had no idea his fellow technical college classmate had been praying for him. John Sarria (right) prays with his friend Carlos after Franklin Graham's invitation to accept Christ. When Carlos came forward to accept Jesus, John had the privilege of being his counselor. "He told me to come with him to the Festival because it would be important," Carlos said later. "I will have to make some changes in my life, and I will be more at peace because I know there is something after my death." That "something" is eternal life with God, and on Friday night, hundreds of people made the decision to spend eternity with Him. "I'm super excited," Lucy said as Eloisa stood by her side. "I want to stay with her on the start of her new path with Jesus, and I will help her." The Festival de la Esperanza continues on Saturday, May 2. Please pray for the Holy Spirit to move powerfully. You can have peace in your life, too. Find out how. 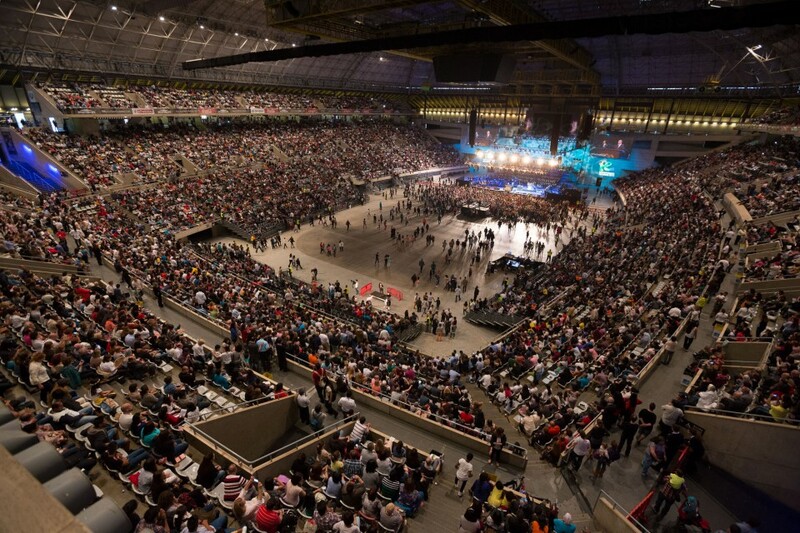 More than 14,000 people packed the Palau Sant Jordi in Barcelona on Friday night. Hundreds came forward to accept Christ, answering the prayers of many of Catalonia's faithful Christians.